At Redesign + More, we offer a variety of interior design consultation services. Including interior redesign, real estate home staging, budget design decorating and holiday & event decorating. Our experienced team of certified design professionals can assist with all your design and holiday challenges. Experience a fresh decorated home, one that is a reflection of your own personal style. A perfectly designed and redesigned space will give us a peaceful place, for simple conversations or a space for energetic gatherings with family members and friends. Our goal and overall design philosophy, is to create beautiful and inviting interior designs, lifestyle interior redesigns and enhance the architectural features of your interior and exteriors home for a successful showing. Our design team finds satisfaction in creating that special experience with each client we partner with. As a owner of Redesign + More I have always had a passion for Interior Home Design - Interior Redesign- Home Staging and Interior Decorating. I learned the basic concept of Interior Redesign - Real Estate Staging - through hands on experience, training and certification. I can create a room that not only functions well but also shows the home owners personality. My previous career in corporate management, recruiting and sales has helped prepare me for working with clients, budgets and meeting tight deadlines. I am Certified - Licensed in Real Estate Staging- Interior Redesign - One Day Decorating - Interior Design - I find satisfaction in helping homeowners personalize their home and working with builders to create wonderful model interiors. beautiful, spacious - staged homes. Interior Redesign - Great Interior redesign- is much more than moving furniture around, it considers the focal points, architectural features, lighting, interior room function and traffic flow, as well as furniture placement, color and new design styles. We will provide a complete one on one consultation with you. At the end of the interior room redesign- we will offer advice on possible paint colors as well as fabric, furniture and accessory ideas. Most importantly we consider you, your personality, your family, your interests and your budget. Your home is a reflection of your lifestyle. We can help you emphasize what is important to you. You will be amazed to see how wonderful your rooms space can look with the correct furniture and lighting layout, and how proper accessories will make your room feel warm, inviting and finished. Creating interior redesigned rooms - you will love. Interior Design - Whether you’re building, remodeling or giving your home an enhancement makeover Redesign + More can assist you with those important decisions. Our design services include a project design, room plan, lighting selection, material requirements, furniture selection, color coordination, window treatments, flooring options and accessorizing. Redesign + More will save you time and pass along our partnership savings so you can feel at ease through out the design project. Real Estate Home Staging - Smart sellers and Realtors realize the importance in real estate home staging. Statistics have shown a staged home sells faster in the real estate market. It's investment that comes back at the closing table and the cost of staging is always less than the first price reduction. As professional home stagers - Redesign + More goal is to offer you a visual inspection of your home and prepare it for the real estate market. We evaluate every aspect of the interior and exterior of the property that impacts marketability. You receive a detailed report of each room, which will emphasize the home's selling points as well as a list items for home improvements. Redesign + More can help you de-clutter, organize and showcase the home's focal points. When staging your home we will tour your home just like a potential buyer will, with an eye to details and features to be highlighted for showings. We determine the best way to highlight your home’s features and give our recommendations for changes. Our recommendations may include furniture placement, and accessory arrangement, editing, organizing, and more. Full Service Staging - Professional staging performed for every living space in the home, accessory detailing of all staged rooms and areas, pack & box up items that will be removed for the staging project. Staging includes interior and outside curb appeal. Key Room Staging - Includes focusing professional staging in the kitchen, dining room, living room, master bedrooms and master bathrooms. home improvement recommendations and home staging solutions. Customized Flex Package - Our flexible customized staging will do as little or as much as you like. Our team works within your budget and focused on how to best increase your home staging investment. Open House Staging - Arriving on the day of your open house, we will help you set the stage for a successful showing. The last minute details and touches can make all the difference. Residential & Commercial Real Estate Listing Marketing Package – We offer services for marketing your real estate listing, we know that potential residential home & commercial buyers are shopping for listings on the internet. Our team helps market your real estate listing on social and real estate networking sites, we can create a real estate marketing website and blog that helps increase internet visibility. Our business partners include professional experienced photographers trained in capturing great residential & commercial photos and a network of professional contractors. Properties staged with attractive furniture and accessories sell more quickly and for higher prices. Ask about our resources for affordable furniture & accessory leasing. Builders have always realized the importance of enhancing model homes with window treatments, area rugs and custom colors. Most builders are utilizing model home staging because they appreciate and understand the value of staging. There is a growing demand for staging new construction, investment properties and spec homes. Not only is staging practical, it is cost-effective. The investment of minimal furnishings enables builders to reduce their decorating budget. In addition to staging, we work with builders in selecting design elements for new construction including cabinetry, flooring, hardwoods, paint selection and lighting. Professional Home Organizing - Are you feeling overwhelmed, behind schedule or stressed out? Then let Redesign + More put organization back into your homes - bedroom - kitchen - closet - playroom - home office - garage - attic - basement In addition we offer filing systems solutions and paper management solutions. Professional Office Organizing - We will de-clutter, reorganize and redesign your office spaces. This includes offices, desks, filing systems, paperwork, mail, email, time management and productivity challenges. By implementing a computerized filing system and paper management solutions, this will simplify your life, you will be become clutter - free, be more productive, maximize time, space & activities. Hospitality Interior Design & Redesign - Redesign + More will present preliminary design plans, furnishings, and colors, reflecting proposed design intent. A variety of layouts may be developed in this manner, offering the right design solutions- You will become an important part of the design process. The design ideas are presented to you in two formats that is easily understood. Space Planning - Color Consultation - Theme & Concepts, Custom Furnishings - and Budgets are also developed at this time. Small Space Decorating - Apartment / Condominiums / Dorm Rooms - We can help design & decorate those small spaces. We can accommodate young adults personal design styles and offer solutions in helping them stay focused,organized and on track. Small Business Interior Design, Redesign & Decorating Services - For client office waiting areas, professional office spaces & retail store fronts. Our team has an understanding that each client has specialized design needs. We can help transform your business spaces into a unified look, that creates an inviting environment for employees and clientele. Color Consultation Services - Color maybe the easiest and least expensive way to transform the mood of a room, choosing color can sometime be overwhelming. Our color consultation services offers a color palette that reflects the mood, function and lighting you want to feel in the space. Ready and available are a full line of Sherwin Williams and Benjamin Moore paint swatches to view. Redesign + More will create interior color palettes that reflects your homes interior design, interior redesign or real estate staging to sell project. Interior decorating services for holidays, special occasion decorating events, such as birthday parties, anniversaries, retirement parties, etc. can be time consuming and we do not always have the energy that is needed to create that inviting atmosphere. Our Decorating Experts - can create a simple or elaborate display whether its for home or a corporate event business function. Let us handle all the details so you can enjoy life without the stress! Professional Shopping Services - Need help finding the perfect accessories for your room(s)? We can advise you on how to take your room to the next level and do the shopping for you too. We have a variety of resources for furniture and accessories. Garden & Patio Makeover - Consultation and makeover design for curb appeal, exterior architectural styling, potted gardens, landscape design, patio and exterior staging. Room Makeover Gift Certificates - Surprise someone special in your life with a beautiful room makeover gift certificate available in any amount and for any of our Redesign + More services. Give the gift of a room makeover for weddings, showers, baby's room, mothers day and holiday gifts. Affordable Budget Interior Home Decorating - We find that many people are looking for ways to save money on home decorating, but they still want a designer look. We have an expert approach to create appealing home decor that compliments your style and stays within your decorating budget. Benefit - We come to your home and bring the decorating ideas to life. Affordability - We work within your budget and provide you with economic value. Redesign + More Experts - That is the best part. You will get a professional and trained interior decorator that knows how to turn your house into a home. Our Budget Interior Home Decorating Services is your resource for decorating your home on a budget. You’ll never get a second chance to make a first property impression! Create the final first impression for that perspective buyer by staging - your home. Staging - is the skill of returning a property to its model home beginnings. Should the need come up; we can help by providing furniture and accessories on a rental basis. Charlotte NC - Winston Salem NC - Hickory NC and Surrounding Cities In North and South Carolina . ▪ Refrain from exchanging negative aspects about a client’s home. ▪ Homes that are staged are shown more, maximizing Realtors exposure. links to the Realtors listing page. At Redesign + More we have a mission, we will work with you to achieve beautiful spaces that are functional, inviting, and reflect your personal style. We use our expertise and give you a professional's view for interior design, detail and style. Your belongings that you have tell your story. We reintroduce them and recreate arrangements to suite your lifestyle needs and the architecture of your home. Redesign + More helped me transform my homes interior from feeling like a cave to a bright, warm and cozy home. I had planned to put my home on the market for sale, I love my homes interior so much that I decided to stay in my home. Thank you Redesign + More. Thank you for all your help Redesign + More, I am very happy with my homes interior redesign. Wow! We love our new furniture and I cannot believe the family room not only did we get a great Room Design we also were able to incorporate our old with the new Interior Design. We never thought the house could look so good after deciding on your Real Estate Staging Services. We will have a buyer real soon I can feel it. Thanks again Redesign + More. Peggy you and your Professional Redesign team are amazing you never forget one detail my Room Makeover is exactly how I wanted it to look and feel thanks. Call today for your Interior Design - Interior Redesign - Real Estate Home Staging - Holiday & Event Decorating Consultation Services. Holiday Seasonal Event Decorating Services. Our team of professionals will create a customized holiday decorating plan that will enhance the unique features of your home or business. We can use your existing holiday decorations or purchase new decorations. 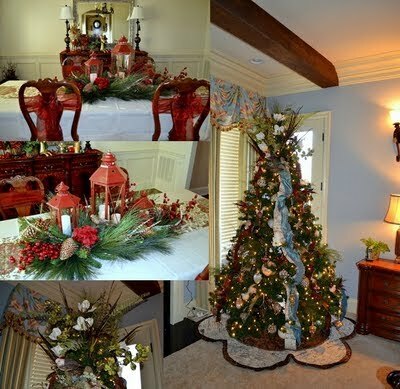 Professional Company providing Holiday and Event Decorating Services, Interior Design, Interior Room Redesign and Real Estate Home Staging Services in Charlotte NC, including South Charlotte, Weddington, Concord, Mt. Holly, Huntersville, Cornelius, Davidson, Belmont, Lake Norman, Mooresville, Statesville, Hickory, Winston Salem North Carolina & South Carolina. "Decorating the Holidays One Season At A Time"